Yes inducted into Rock and Roll Hall of Fame! At last! Yes they can! YES will be inducted into the Rock and Roll Hall of Fame for the Class of 2017, it was announced this morning. The induction, following two previous nominations, will occur one year shy of the legendary progressive rock band’s 50th anniversary. The members of YES who will officially be inducted into the Rock Hall are the “Union” tour line-up: current members White and Howe, the band’s late bassist and founding member Chris Squire, and former members Jon Anderson (vocals), Bill Bruford (drums), Tony Kaye (keyboards), Rick Wakeman (keyboards) and Trevor Rabin (guitar). In addition to Steve Howe and Alan White, YES’ current line-up includes Geoff Downes (keyboards; first joined in 1980), Jon Davison (vocals since 2011) and Billy Sherwood (guitar/keyboards in the 1990s and Chris Squire’s choice to take over bass/vocals in 2015). Founded in 1968 by Chris Squire and Jon Anderson, Grammy-award winning recording artists YES have created some of the most important and influential music in rock history, such as iconic pieces “Roundabout,” “Close to the Edge,” “I’ve Seen All Good People,” “Owner of a Lonely Heart,” “Starship Trooper,” and countless others. Its albums, including Fragile, Close to the Edge, Tales from Topographic Oceans, Relayer, Going For the One and 90125, have been certified multi-platinum, double-platinum, platinum, and more by the RIAA, and have sold over 50 million records total in its career that has so far spanned almost five decades. Among the world’s most influential, ground-breaking, and respected progressive rock bands, YES continues creating masterful music that inspires musicians, fans and music lovers around the world. Look out for the episode this week when we will undoubtedly be talking about this – and add your comments here! Now for the Yes appearance with Jon Anderson. My thought is great however the whole band should come together for one song all players past and present and really show the world what Yes is really all about and that would be the music! Wow. That would be amazing… I suspect it would be Roundabout though. AT LONG LAST. Interesting to have chosen the “Union” tour lineup. I guess this is the best way of ensuring the combination of originals (Anderson/Squire/Bruford/Kaye) and ‘Classic’ (Wakeman/Howe/White) and ‘Modern’ (Rabin). Of course this means it includes 3/5 of ARW and only 2/5 of ‘Current’ Yes. Seems a little hard on Banks and Downes though. I have given some thought as to who should be in the HoF over the last day and, despite the fact that I really love the current Yes lineup, I think the HoF got it right. Geoff appeared on one album back in the old days. His work with the Buggles or Asia might get him in the the Hall of Fame before his work with Yes. 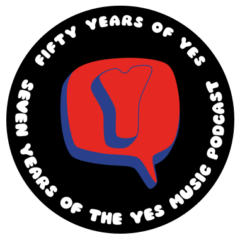 I understand the question about Banks but, from my perspective, had it now been for the Yes Album (aka, the first one with Steve) I think Yes might have been a band that a handful of people had heard of. Fans like us have a special affinity for all members of the band, past and present but do they deserve to be in the HoF? I don’t think so – not yet, at least. Even if there had not been a “Union” lineup I probably would have picked these particular musicians to be in the Hall. Both Bill and Alan were certainly part of key albums, as were both Trevor and Steve and both Rick and Tony. Long overdue but still good news. It will further add to the interest of 2016/7 as a great era for Yes and ARW activity, but before we all get too excited, note Rick’s comments on his own website today, namely that he will not be attending the induction or have any part in a reunion. Personally, whatever he feels I think he could have waited to see what develops before reacting quite so categorically but I can also understand him wanting to avoid a barrage of questions and speculation. Bill said he will attend but not play. Jon wants all of the inductees to play together one more time, plus Billy on bass. We’ll see if Jon can persuade Rick and Bill to change their minds for 1 night. We are rejoicing and we are so happy for the guys! I’m pleased that Yes will be in Rock and Roll HOF. Yes….it’s sad that it couldn’t happen a couple years earlier so that Chris would be involved, but I’m a little miffed at Rick anyway for his statement and boycott. Tough band to do the inductions on. The Union line up was as good of place to as any, but I do have one small complaint. All members past and present should be in, but I get it. They tried to go as classic as possible, and catch the bridge with Trevor Rabin as well. So a case could be made that Peter, Geoff, Patrick, Benoit, Trevor H, and JD be a part of this at least. But I’m flat perplexed with the exclusion of Billy Sherwood. Billy has a relationship and even a sort of unspoken membership harkening back to the 90’s. (earlier?). When our beloved Chris Squire was leaving this earth, he himself, asked Billy to be the bassist himself for his band, Yes. Billy not only agreed to do this, but he put his whole heart into it. In fact, when I saw the 2016 Yes concert here in Vegas, my wife and I both had to pinch ourselves. If we closed our eyes, we could hear the Fish still booming from the wall of death, and my wife even swears that at certain angles and certain lighting changes, she saw Chris himself there. Billy has gone above and beyond with Yes, and done whatever anyone ever wanted of him in that band that he himself has loved, produced, engineered, played in as a member and a side man, and even co-wrote a couple albums. He’s as much a part of the Yes legacy as say Trevor Rabin. Probably even Bill Bruford. It’s just plain wrong, especially with the wishes of Chris in mind, that he is not inducted with the band. So, if I could only pick one Yes man who will not be going in, that I feel was slighted badly, it would be Billy Just wanted to say a special word about the amazing Sherwood. Oh I really hope you are right and they all play…wouldn’t that be wonderful?